* 2 night minimum stay required. 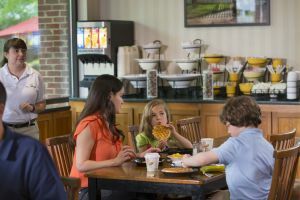 Kids 12 and under, eat free with each paying adult from child's menu in participating Colonial Williamsburg restaurants. Cancellation Policy:This reservation must be cancelled 72 hours (3 days) prior to arrival to avoid forfeiture of your deposit. HOLIDAY CANCELLATION POLICY: Reservations that include the following dates must cancel 45 days prior to arrival to avoid forfeiture of your deposit: W&M Graduation (5/10-5/12/2019), W&M Homecoming (10/17-10/20/2019), Thanksgiving (11/27-11/29/2019) and Grand Illumination (12/6-12/8/2019). Deposit Policy:We require the first night’s room and tax for each room reserved.